The “Quote Matrix“ is based on the same idea as the Crosstabs function, i.e. to create a joint display of themes and quantitative variables. The Quote Matrix does this on a more detailed, non-aggregated level. Here the coded segments themselves are listed in the cells of the matrix, not only the number of coded segments for that particular cell. In the example below, we can see a comparison about what married and single people said about certain themes. emotions Happiness does not remind me of one event. It makes me think of my life. Even though there are bad times, overall I am very happy with the way I turned out as a human being and I like were my life is headed. Sadness reminds me of the death of my grandmother (Dec. 90′) and my grandfather (June 96′). Their deaths effected my life greatly.They were like my second parents. New York/GINA: 12 – 12 (100) I feel as if I am very healthy and I know that I have a firm background on what being healthy means because of my interest in Nutrition and Exercise. I always to try to eat better and make the right choices and exercise on a regular basis. education My career now is college. I am graduating this weekend from my Community Health Undergraduate program at Hofstra University. I am continuing my undergraduate studies at CW Post in the fall to get a BS in nutrition. Getting my RD is my major career choice. I would like to improve my dedication to working out. I am the type of person who will work out 5 times a week for a month straight and then is slowly turns into less days a week until it is none. I get distracted by school work, my job or just being tired. New York/Silvia: 42 – 42 (100) My major is Dietetics and I am planning on working with children at either a center or a Children’s Hospital and do meal plan counseling for children that need special diets because of sickness, or whatever the case may be.I know that will not be happy in my occupation unless I work with children. First, activate the codes you wish to include in the Quote Matrix. You can find a detailed description on how to select variables for matrix columns in the Crosstabs chapter. When you click OK, a dialog window will open in which you can create a file name and select the location where the Quote Matrix will be saved. The matrix can be saved as an Excel, HTML or RTF file. For a matrix with many columns, Excel format is recommended, for a matrix with few columns, RTF format is recommended. The file will open automatically upon export. 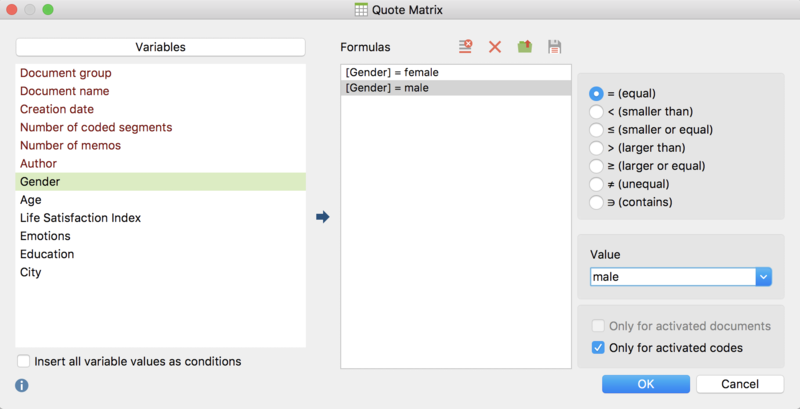 Tip: You can also generate a Quote Matrix directly from the Code Matrix Browser or Code Relations Browser or Crosstab by clicking the Quote Matrix symbol.